The service was over…we were waiting in the car…Sam was behind the wheel…Grace and Ben were in the back seat….it was quiet…. I told them how proud I was to be their mom in this moment. They were completely amazing at the services. They stood by me, greeted people, smiled, laughed, talked, hugged, helped me, and supported me. Then, Sam and Grace stood on the stage with such dignity and grace. Their words ministered to so many people. Ben sat right beside me and held my hand most of the service. I was so thankful for what God had done. I took a huge breath and started sobbing. The kids were just quiet and Sam reached over to hold my hand. He just squeezed it tight. I wanted to scream really loud, and just let it all out. I felt a huge ball of fear knot up in my throat, as if it would choke me. My mind started racing and my thoughts were all thoughts of despair. But, then this song came to my mind…. Y’all, this song has meant so much to me during this time. I can’t tell you how many times I would be playing Pandora and this song would miraculously come on at the perfect time. He is not leaving me alone. I am NOT alone. I am not alone. As painful as this is, I can not allow grief to swallow me. I can not allow my enemy to gain one inch of ground. I can hurt…I can weep…but I can not be overcome. God is my strength. He is my help in time of trouble. He is the lover of my soul. His unfailing love is great enough for me now. He will uphold me with His strong right hand. I will not fall. My children will not fall. So, in that moment, I let my tears out and then I started telling the kids how much I trust the Lord. I encouraged them by reminding them that everything we just said inside that service was true. Every word their dad said in that video was true. It’s truth that we will base our lives on. We will choose to live in that truth. It can no longer just be words. This is the part where we walk it out. Speaking of the service…..wasn’t it beautiful?! I was so pleased with it. I know the Lord was glorified and I pray that Clay was able to see it. I think he probably could. I don’t know….but I hope he could see it. Not so he could hear all the good things we said about him, but so he could see how much his death glorified God. Healing Place did such a wonderful job. Clay and I were married in the old building almost 19 years ago. We attended Healing Place for about 9 years. We met there, fell in love there, and had our first two babies there. So, it is like a second home. Judy Davis and her staff were so meticulous and detailed. She took care of everything, which allowed me not to worry one time. I had always imagined that Clay’s services would be held at our church, First New Testament. But, I had several people advise me to consider a larger church because of the number of people that could potentially attend. Our guest book shows that approximately 1,400 people came through the church. Good decision! The wake was Friday evening. Y’all, I can’t tell you how much I enjoyed seeing so many faces that I love. I was overwhelmed by the number of people who came. Old friends, new friends, my friends from work at Capital One, a few clients from my Capital One days, all 5 of my managers from the bank, Clay’s former workmates, his former boss, old church friends, nurses and techs who took care of him, my dear high school friends, Clay’s little league coaches, family…..And, yes, a few people who have been reading the blog, but don’t know us. That was amazing! Don’t laugh, but by the end of the two days, my earring had punched a hole in the side of my neck from all the hugs. Apparently, I mostly hug on my right side. But, it was worth it! I felt so loved. And, seeing all of your beautiful faces reminded me of what a wonderfully blessed life Clay lived, and that me and the kids will continue to live. Our family pictures through the years flipped on the screen while people waited in the long line. So many of you who came through said to me, “What a great life!” And, it was. I remember smiling a lot that night. I think I stood up for over 5 hours, but I never got tired. I was smiling because you all said the sweetest things to me about Clay. I remember everyone who came through the line. The sad part was that I could only have a few seconds with each of you. I wanted to sit down and have a cup of coffee with everyone. I wanted to have more time to visit, but just know that your presence made a huge difference for me. My sweet friends, Christy, Chenelle and Michelle came to help us get ready before both services. They loved on me, prayed over me, pampered me and helped me in so many ways. The funeral was Saturday. At 11:30, people began arriving, and there were more hugs and sweet words said. Clay’s baseball team, The Rangers, all came dressed in their uniforms. That morning, Ben asked me why he couldn’t wear his baseball uniform. He said, “Mom, it’s not fair. I’m a Ranger, too!” So, he settled for a red and blue suit and the coolest red shoes EVER! As the service began, I’ll be honest, I had a wave of emotion as I stood at the casket with Jim and Flo one last time. Because Clay was sick for so long, I had imagined all these moments over and over again. Clay had even talked about what it would all be like. But, to be there, in the moment, was something I couldn’t really be prepared for. None of us could. We just had to trust God that He would be with us. And, He was. Summer, my sister, sang “Oh The Blood.” I was so proud of her. She’s a cryer, but she made it through and did a beautiful job. She did not leave my side from that Tuesday am until Saturday night. She was my personal secretary, my dearest friend, my go-to. I couldn’t have made it without her. James VanValkenberg ministered in song. Clay always loved to listen to James play and sing. He is so anointed. But, he is battling Parkinson’s and is having major physical problems. Up to the very last minute, we weren’t sure he would make it, but God was glorified 3 times when James walked up on that stage and used his gift to glorify God! It was a beautiful testimony. John Green gave a beautiful tribute to his lifelong best friend. They have so many funny stories. But, my favorite thing about John’s comments was when he spoke directly to each of our kids about what Clay said to him regarding his love for them. They won’t ever forget that. It was powerful. Grace read Clay’s eulogy that she fashioned from her own point of view. I wanted to stand and applaud her when she finished. What 16 year old can do something so difficult? At first, she didn’t think she wanted to say anything, but when I asked if she wanted to just read the eulogy, she said yes. Well, then she added all her own stories and funny moments. It was amazing! Ron, Clay’s twin older brother, brought good memories and stories of their childhood and did a good job representing Clay’s family. They had a really wonderful childhood and Clay loved to remember it. As soon as Clay got diagnosed, I had the thought of filming him for his funeral. I just knew that Clay could speak to an audience of grieving people better than anyone else could. And, he did not disappoint. If you haven’t see it, please take time to watch this. I love how his eyes glisten when he speaks. He meant every word, and he lived every day with this purpose inside of him. It was an inspiring thing to watch. Our wonderful Pastor, and friend, closed the service with powerful comments and an invitation to know Jesus like Clay did. He was so involved in our lives during this process, so he could speak from a place of intimacy regarding Clay’s thoughts and his spiritual life. He talked about how Clay gave up all the things he loved about the world after he got diagnosed. He no longer cared as much about baseball, movies, music, etc. He loved Jesus and that’s what he wanted to talk about. I knew that the graveside service would be hot, so weeks before, I had ordered umbrellas to provide shade from the heat. Little did I know we might need them for rain. During the service, you could hear a loud thunderstorm outside. By the time we walked out the doors, following the casket, the sun was shining and it was beautiful. The entire time at the cemetery, the sun shone brightly. It was hot, but very pretty. Then, when we left to drive home, the rain started, again. God parted the skies for us. You just never think you’ll have to do something like this when you are 40. That’s me, with my two boys, following my husband’s casket. It’s surreal. In the moment, all I could do was focus my thoughts on the amazing things God has done. The service was brief. Joanna, Clay’s beautiful cousin, sang “There’s Just Something About That Name,” accompanied by Clay’s lifelong friend, Chris McMorris. Caleb, Clay’s close friend, spoke and did a wonderful job of honoring what God did through Clay. Grant, Clay’s nephew spoke about Clay’s love for people. And, Lee closed the service with a few words and prayer. The pallbearers were Jimmy Cook, Jason Lasseigne, Michael Mullins, Scooter Morris, Caleb Scherer and Jason Doise. These men were all very special to Clay. They were a mixture of family and friends who represented his life. As I watched them carry his body to its final resting place, I was so thankful that they were a part of his life. He was surrounded by such Godly friends. Honorary pallbearers were Grant and Drew Furlow, Max Cook, Todd and Drew Lasseigne. These young men were all very important to Clay. He desired so much for them to know and walk with the Lord. Have you ever seen a more beautiful casket? My uncle, Larry Norwood, made it. In April, just before Clay got diagnosed, I took my grandmother to see Larry. In conversation over dinner one night, his wife Suzi just happened to tell me a story about Larry building the “Heaven Bed” for his brother-in-law. As the time drew near with Clay, I remembered that. Of course, it was difficult for Larry to do, but he labored in love to build it. I loved it. It’s so strange to say that you love a casket, but I loved it. Clay had said before, “Just throw me in a pine box.” Well, that’s pretty much what we did, but it was a beautiful pine box. I asked the Funeral Director to lower the casket before we walked away. I just didn’t want to leave with the casket sitting there above the ground. I don’t know why….that may seem strange….but I wanted it lowered. So they did. We watched as it lowered into the ground. I’ll never see it again. It was hard to walk away. But, as all the people started to leave, I made my way around to say goodbye and thank everyone for coming. Then I looked up and saw this…. My lifelong girl friends. We all met in middle school and we are still friends. All of us still serving the Lord and loving each other. They have done so much for me. I hugged each of them and felt so loved to see them all waiting for me. I love you, girls. So much! These are a few of my favorite pics…. So, here we go. Just the four of us. Living. Walking. Wondering what God has for us next. Trying to heal and grieve and keep moving. Trusting. Loving. Keeping our eyes focused on Jesus. Some days are easier than others. But, I just keep coming back to David’s words in the Psalms…. We love you. Thank you for your continued prayers, cards, acts of love, texts and calls. Thank you for holding us up. God has great things in store. We believe it. Thank you so much for sharing this journey with us all. You and your family have been such an inspiration, such an amazing example of what it really means to walk with and truly 100% trust God. I saw you at the football game this past Friday, i should have told you all this in person. Your husband coached my son in baseball with Sam about 5 or 6 years ago. I hope you continue to write, and share, and witness. God bless you and your family. I cried at every word I read. It has been hard to see pictures of Clay. You never cease to amaze me. You are so right ! You are not alone. I pray for you and the kids every day, all day long. Also Flo and Jim. I am coming over soon. Just giving you some time. Love you much! In 2000, I was separated from my husband and teaching at St Jeany Vianney school. I was the music teacher and also the band director. I taught K-8 music and did the band before and after school. The Goudeau family’s children, Kelly and his younger sister, Claire, were in my music classes and Kelly was also playing trumpet in my band. In the fall of 2001, Claire was diagnosed with a brain stem tumor. She had begun to lose her balance and after tests were run, the tumor was discovered. That was in November. She was in the 4th grade and loved my music class. At first, she could get to the music building with the help of friends on either side. Then she had to use a walker. By January, she was in a wheelchair and soon her whole left side was paralyzed. She was an excellent piano student and loved the piano. However, she had to stop playing because she could no longer use her left hand. I brought a keyboard to her house just before the Easter holidays and set it up in the living room. It had all the bells and whistles and would allow her to just play tunes with her right hand and the accompaniment would play automatically. Her mother, Susan, situated Claire in a chair at the piano and put some music on the stand. It was “My Heart Will Go On” from “Titanic” We sat there and she played the right hand and I played the left. As we played, I turned back to look at her mother and she was completely in tears. Claire got tired and had to go lie down. After she left, Susan told me that Claire had refused to touch the piano because she was so upset about not being able to play, that she had not played in several months and Susan thought she would never hear her play again. Less than a month later, Claire died. I went to see her one last time and through my tears on the way home God gave me the following song for Claire. I sang it at her wake. The title of this blog made me think of it. I have not played it in a long time, but it so fits what you have said. Instead of Claire’s name, I have substituted Clay’s. I stand out in the sunlight, feel it’s warmth upon my skin. We are not alone, Jesus has claimed us as His own. Children of grace, able to face the twists and turns our lives may take. I gaze with thankful reverence on this earth our God has made. To worship in this family of God where we belong. He will not leave us, the love of Christ will see us through. A child of grace, able to face the twists and turns his life would take. Copyright 2002 Finnsong Music, Inc. It was good to see you, if only briefly, at school the other day. You looked wonderful as usual. The strength you have had has been an inspiration to so many people. I continue to pray for you and the children. “Do you not know, have you not heard? Yahweh is the everlasting God, the Creator of the whole earth. He never grows faint or weary, and there is no limit to His understanding. Youths may faint and grow weary, and young men stumble and fall. But those who trust in the Lord will renew their strength. God bless your family Kristy. You do not know me but I started reading your blog when it was shared by Stacey Willms the most amazing woman I know. I have cried reading your words. I lost my husband in 2004, less than four years after his diagnosis of ALS. I have three daughters and they were 10 and 5 when he passed. The words you wrote were me all those years ago. I thought to myself wow, she is writing about the same things I felt during that time. 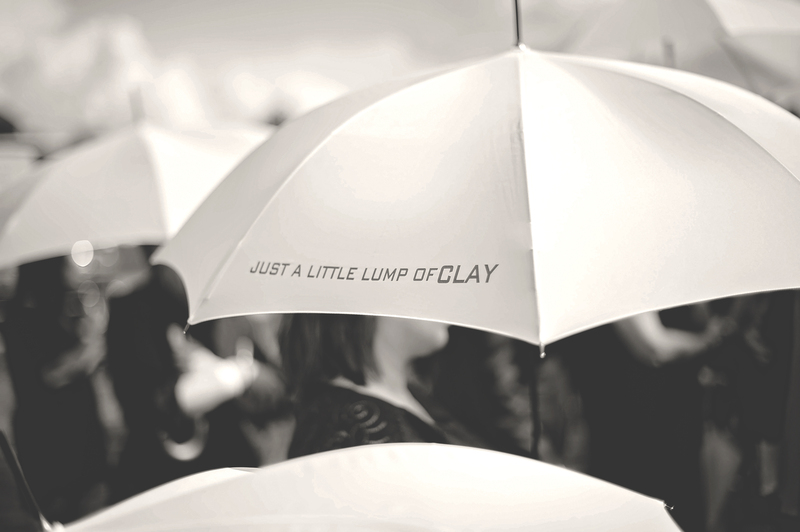 You said that you hoped Clay could see the service and all the people that were there. I know he was there and I pray you get confirmation of that. I said the same thing and shortly after my husbands service he came to me in a dream and said a final goodbye. It was as real to me as anything I could imagine. He confirmed he was there and that he was in heaven and at peace. I am praying for you and your children and hope that your grief will be taken over by all the beautiful memories you have of Clay. Know that he will be with you. You will see him in your children and you will get the signs you need to know he is around you. You are obviously a strong woman and having to exhibit this kind of strength is something many cannot understand. I can tell you the grief will subside and the sadness will go away but you will never get over this loss. There is no timeline to your grieving. Thank you for sharing and god bless! God Bless you and your children. What a legacy Clay left for y’all. Praise God for Cody’s life. God speed to you all. PS Ben looks just like Clay. Precious!!! I’m sorry I meant Praise God for Clays life. Autocorrect is the pits.